If your growing weariness of being constantly tethered to the internet has become overwhelming, it might be time to scrub yourself from the social media sphere altogether. 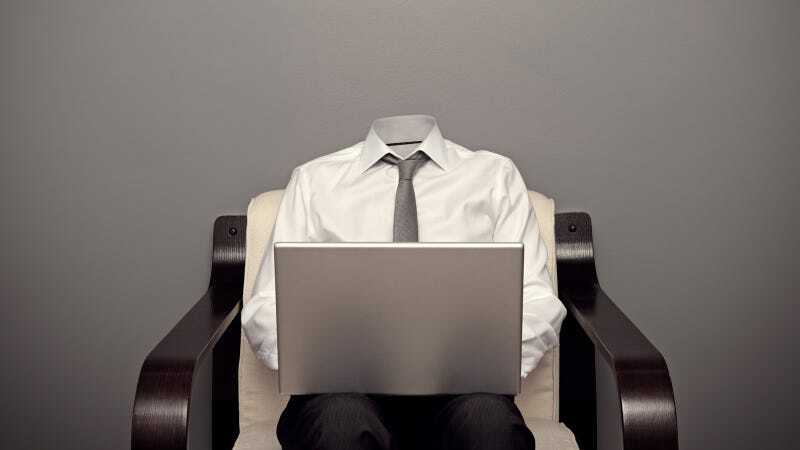 Here's how you can become a ghost on the Internet, by tracking down and eliminating your digital past. Before you go hunting down your old MySpace and Yahoo Fantasy Sports accounts, you should probably go ahead and nix your existence from the four largest social media sites on the planet—Facebook, Twitter, Google+, and LinkedIn—seeing as how they have the greatest reach and the most information on you. Luckily, each service makes the self-destruct process fairly straightforward. To truly nuke your account, you need to head to the Delete My Account page and click the big blue button. That's it, you're officially off Facebook. The process might take up to a fortnight to complete since the system has to scan the entirety of itself making sure all data related to you—every tagged picture, like, and mention—but when it's gone, it's all gone. The process is irreversible. Don't worry, though; if you still want that treasure trove of pictures and updates living on your hard drive, you can download the whole shebang by going to Account Settings > General > Download a copy of your Facebook Data > Start My Archive. Unlike on Facebook, on Twitter deactivate means delete. And it's easy! Go to Account Settings > Deactivate my account > Okay, fine, deactivate account. Then just enter your password and you're good to go. Well, almost, anyway. Twitter also holds onto your info in case you have quitter's remorse, so it'll still stick around on the company's servers for 30 days. After that, though, you're all clear for a RTless life. Another easy one. Head to the upper right hand corner of the page, and select Privacy & Settings from the drop-down menu. From there, head to Account > Close Your Account. Answer a quick question about why you're leaving (as if you need a reason! ), verify your account one more time, and then revel in the fact that you'll never get LinkedIn spam again. It'll take a while for all professional network traces of you to leave Google and other search engines, but you'll be purged before long. There's a decent chance you're a Google+ member without even realizing it—which makes leaving all the more compelling. It's also the most convoluted process of the four. The important thing here is to delete your Google+ information and account without nuking your Google account (assuming you're a Gmail and Gcal user). To get rid of just your public information, first sign into Google+ if you somehow aren't already. Click your name and/or email address in the upper right hand corner, and go to Account Management > Delete profile and remove related Google+ features > Delete Google+ content. That'll take care of profile, your Circles, your +1s, etc. To get rid of your entire Google+ account, meanwhile, repeat the above process, but select Delete your entire Google profile. This sounds scary! It's not. You'll still be able to use Gmail, your Google Drive, and so on. It will, however, totally vanish your Google+ presence, and will make for some annoyances if you've coupled it with other Google accounts (most commonly YouTube). If you really want to go all the way with this and delete the entirety of your Google account (mail, calendar, etc). To do that, go to to your Google Account homepage, click Close account and delete all services and info associated with it, and kiss Gmail and every other Google-thing you love goodbye. Once you've taken care of the four elephants in the room, it's time to go after your smaller and older accounts. But unless you've been keeping meticulous notes on every single forum board and half-baked social site you've ever joined, you're going to need to spend a fair amount of time tracking them all down. Luckily, there are tools for that. Account Killer maintain massive database of sites—more than 500 in all, from Activision to NuddistConnect.com to Zattoo—and can provide direct links to each one's deletion page. Just Delete Me offers a similar service, as well as a handy Chrome Extension that will light up whenever you're on a site that JDM recognizes and will link you directly to the site's account deletion page. Knowem, meanwhile, finds sites that you may have forgotten about entirely by doing a username search on more that 500 popular social sites.